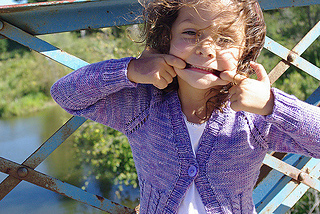 Shortly after Mr. Greenjeans appeared in Knitty back in the fall of 2007, I knew that I wanted to design a version for girls too. Et voila, merely two years later… ahem. 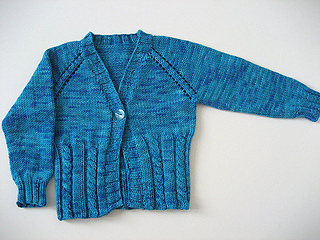 This version features kid-friendly full-length sleeves and a less cropped shape, but maintains the single button closure. NOTE: This pattern is sized for an open fit. Please do check the finished measurements carefully before casting on, or select a larger size. 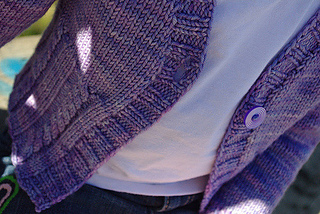 ERRATA: If you have version 1 of the pattern, the instructions for size 8 have an incorrect number of stitches at the bottom of the yoke. You should only have 204, not 214. All other instructions are correct.